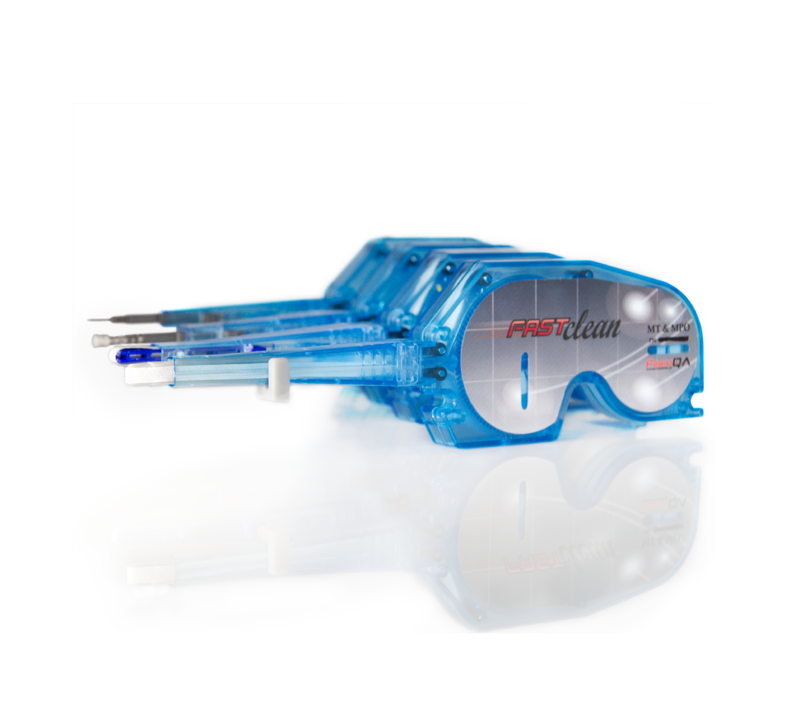 FastCLEAN is a line of disposable fiber optic end face cleaning cartridges that are utilized in FiberQA's line of AVIT systems. The inspection cycle is not only automated, but it now integrates cleaning into a one step process to eliminate part handling damage and reduce processing time. Battery operated motors run the patented thread over the cartridge tip for a specified amount of time (3 seconds) when the pressure sensitive tip is activated. This automation ensures the connector will be cleaned EXACTLY the same way, no matter who the technician is. Does FastCLEAN use a wet or dry method? FastCLEAN is a dry clean, using a patented thread technology. How many cleans are in a disposable cartridge? There are approximately 600 cleans in each cartridge. FastCLEAN has a 95% first pass clean rate, using a pre-determined amount of length that moves over the fiber end face. How often does a technician need to change the batteries? Batteries should be changed every time a cartridge has been spent, and before a new one is inserted into the tool for use. What kind of maintenance needs to be done on the FastCLEAN tool? Your FastCLEAN needs to be maintained in a clean environment, free of dust and grease. The provided protective cap should be screwed onto the FastCLEAN whenever it is not in use. This cap will protect the tip and keep it clean. Your FastCLEAN tool will last for years without any other maintenance, apart from replacing the AA batteries. Yes, the technology used in FastCLEAN is unique and patented.